We often discuss about how fashion greatly combines its high and low different sides, creating new trends and aesthetics. Forever 21 just brought this concept to a brand new level, presenting its pre-fall 2016 campaign that perfectly combines Gucci‘s Geek and Seventies-infused style with the American retailer’s laid-back attitude towards fashion. Hey, we can already shop for this collection at Forever21.com to add a designer flair to our transitional wardrobe without spending much! Aside from the campaign, which clearly pays homage to Gucci’s most iconic ad pictures (such as the most recent one), it’s the Forever 21 pre-fall 2016 collection that mostly draws inspiration from the Italian luxury house’s aesthetics, both in terms of colors and patterns, as well as common silhouettes. Filtered through what looks like one of Instagram’s vintage filters, the campaign neatly shows us Forever 21’s must-have staples, focusing on covetable, transitional pieces that will inevitably become must-have wardrobe essentials within a few months (summer is drawing to a close and that’s sad indeed, but at least we have something fun to long for!). As for the clearly Gucci-influenced looks, the high-street fashion brand took the Italian Maison’s retro and Seventies-inspired proposals and turned them into fresher, more wearable staples anyone could channel not only on a daily basis, but for a night out too. 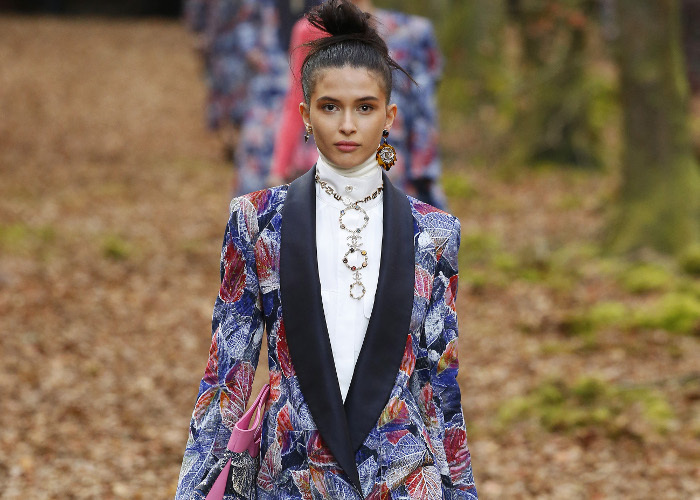 Mini dresses with zigzag patterns, bell-bottom jeans, faux fur coats and A-line midi skirts dominate the ad campaign, catapulting us in one of That Seventies Show‘s episodes (and making me extremely happy). Besides the Gucci- and retro-inspired garments, this Forever 21 pre-fall 2016 collection features a few Nineties staples too, reminding us it’s always a good idea to mix and match the trends of these two decades with one another. We thus see flared jeans gracefully combined with cropped tops and t-shirts, as well as fancy varsity jackets creating an appealing contrast with the most conventionally feminine proposals. Miniskirts, striped tees, floral embroidered bomber jackets and skinny jeans eventually find their way through the collection’s more vintage staples, getting us ready for the extremely variegated Forever 21 fall 2016 accessory line. Like the clothing line, we could divide the accessory line into two different categories, the Seventies- and Nineties-inspired motifs of which are more than captivating. While chunky ankle boots with glittery embellishments, beanies dipped into opaque colors and big, earthy-toned belts clearly recall Gucci’s past and more modern aesthetics, the rounded sun/eyeglasses, bandana scarves and chokers are all about the Nineties, letting especially those who love both the decades and styles have something versatile to choose from. The best part about this transitional Forever 21 line-up lies in its ‘moody’ attitude, which not only means that any kind of personal flair will find something suitable to wear, but also that we should embrace our moodiness and translates it to creativity.